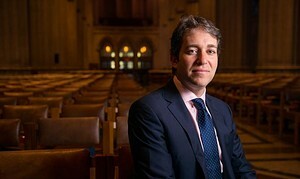 Steven Fox Named Third Music Director of Cathedral Choral Society | Dispeker Artists, Inc.
Fox is the Artistic Director of The Clarion Orchestra and The Clarion Choir in New York City, and Founder of Musica Antiqua St. Petersburg, which he established as Russia’s first period-instrument orchestra. A 2017 GRAMMY® nominee, he has appeared as a guest conductor with many renowned ensembles including Philharmonia Baroque Orchestra in San Francisco, Handel and Haydn Society in Boston, Juilliard415 at Lincoln Center, the Charleston Symphony Orchestra, the Quebec Symphony Orchestra, l'Opéra de Québec, Music of the Baroque in Chicago, and the Tucson Symphony Orchestra. The Cathedral Choral Society is the resident symphonic chorus of Washington National Cathedral. Now in its 76th season, the 140-voice chorus presents a series of four programs at the Cathedral and has appeared as a guest chorus at the Kennedy Center with The Washington Ballet and National Symphony, at Wolf Trap National Park, and at Meyerhoff Symphony Hall and Strathmore Hall with the Baltimore Symphony Orchestra. The chorus inspires and supports singing in schools through its annual High School Choir Festival and DC Choir Partner program.